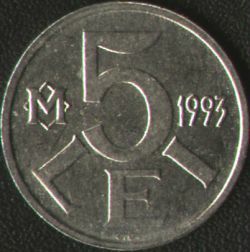 denomination "5 LEI", year 1993, M standing for Moldavian. 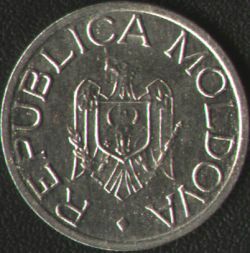 Below the E in LEI stand C.D., the initials of the engraver (Constantin Dumitrescu) Moldavian coat of arms and inscription REPUBLICA MOLDOVA meaning "REPUBLIC OF MOLDOVA"
5 LEI is hard to find. 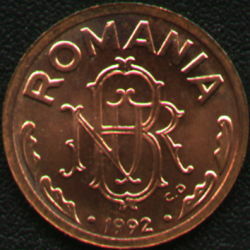 It does not circulate anymore, but it was worth a pretty penny for a few years.